Atlas Obscura has, over the years, built a brand synonymous with strange and weird, yet interesting and intelligent. Their mission statement embraces this sentiment, “to inspire wonder and curiosity about the incredible world we all share.” They claim to have visited 16,289 unique places, told 9,302 stories, held 1,163 events, and guided 348 travelers to out of the ordinary global destinations. Building on their success, Atlas Obscura is reaching out to the next generation with The Atlas Obscura Explorer’s Guide for the World’s Most Adventurous Kid. In the opening letter to the reader, one concept is explicit, and grounding for the kids: that where ever they happen to be living, they “are already somewhere amazing.” Kids don’t have to go far to find fascinating things. Around every corner is a new experience. But in case they were wondering, there are lots of possibilities for a lifetime of adventure beyond the backyard. This book takes the reader to 47 countries and 100 unique spectacles. It is bound to get the imagination gears churning. Preparation is a big part of any expansive trip, even a literary one. Before the journey begins, a packing list is offered, which gives the readers a good starting point. Cameras, clothing, safety, journal supplies, flash light—are all basic necessities for any type of expedition. Then comes the plan of attack. The check list/itinerary doubles as a table of contents. After a briefing on latitude and longitude, the reader is off and running, or in this case most likely flying, to the first two destinations: the inside of Iceland’s Thrihnukagigur Volcano and the blue whale migration near Húsavík. Each country is presented on a full page, full color, graphically appealing spread. Quick fun facts reveal basic information as well as odd trivia. Reykjavik is the world’s northernmost national capital and Iceland is the home of the world’s only school dedicated to studying elves. The bottom of the right-hand page holds a link to where the reader will travel next. This is by no means an efficient travel system, locations are linked by a common curiosity. From Iceland, we head to Zambia. Zig-zagging around the world, using multiple modes of transportation, the reader will see both manmade structures and natural phenomena. There are on the human side, sunken cities, abandoned ruins, re-purposed attractions, and technological achievements. Jellyfish, penguins, plants, fire and ice are on the natural side. Most locations boast the grandest, longest, largest of something or other such as the ice cream shop in Mérida, Venezuela with the largest amount of flavors on record, or the Marree Man, one of the world’s largest geoglyphs in Australia. Graphically, there is much to look at. Using a subtle Ben-Day dot technique (a la Roy Lichtenstein) the reader is, page after page, immersed in a comic-book-like action sequence. While the cartoon aspect may appeal to the younger readers, it gives the impression that all of these marvelous locations are pure fiction. It feels like a beefed-up version of a Dora the Explorer episode instead of an enticement for young adults, who are the intended audience. With part of the greater Atlas Obscura concept being phenomenal photography that rivals National Geographic, one has to wonder why they chose to abstract and cartoon-ize all of these places. Why not incorporate the actual images of these wild and wonderful destinations like they did in the grown-up’s version Atlas Obscura: An Explorer's Guide to the World's Hidden Wonders in 2016? The book would have stayed truer to the overall design concept of Atlas Obscura and would have been a more realistic, and frankly more exciting, representation of real-life places kids could potentially visit. One thing is for sure, the reader will never get lost. A consistent feature is a globe on every page tracking current and subsequent locations complete with GPS coordinates. Upon completing the journey, which winds down in Chile, there is no doubt about the conclusion that the world has plenty to offer. Instead of being on an exhaustive itinerary, the kids are encouraged, as they close out the book, to dream of more, after all there are still 16,189 more places to see from Atlas Obscura alone. 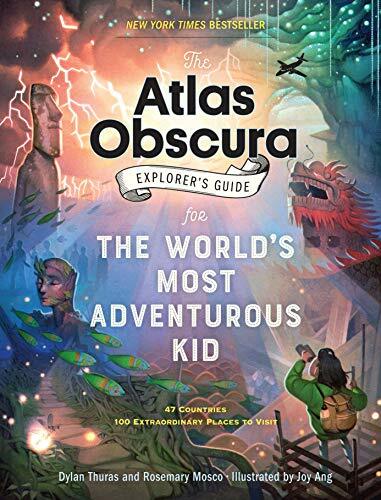 The Atlas Obscura Explorer’s Guide for the World’s Most Adventurous Kid will connect kids with the world beyond the traditional textbook tourist spots (the likes of the Roman Colosseum, Paris’s Eiffel Tower and London’s Big Ben) and will lure them into a deeper exploration of their surroundings.